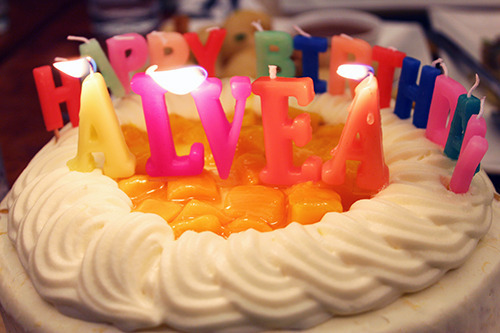 Beyond Legal: My 19th Birthday – Alvea S.
Before this, all I knew was that we were to have a Core bonding/meeting. I even endured a standing bus ride along the infamously sluggish traffic of Taft with Angela and Noreen. When I asked them, the two denied any involvement whatsoever in the surprise, so I believed them. And the classic find-the-next-clue-til-you-reach-me stint began, with 8 stations strategically routed to end up at … (you’ll know where, but for now, come unravel this surprise with me). So here we have the main entrance (with Mikee), where she gave me my first clue. Reading it made me smile because it shows how Christiane knows me so well. National Bookstore is indeed a therapeutic place for me, especially the one in Harrison Plaza, where I used to hang out a lot with friends during high school. I know it isn’t the place for that, but their branch of NBS is one of the relaxing ones, where I can freely sniff the aroma of books, old and new, and do some private reading along their virtually secluded shelves. Here’s Sam, whose acting skills actually led me to thinking that he wasn’t part of the whole scheme, complete with props and his chuckling gait, like he was equally baffled to see us there. He even pretended to be in a hurry before he finally gave in and handed over the next clue. Now about that, I’m sorry for the absence of a visual (I couldn’t find it anywhere). Perhaps I had misplaced it, or maybe someone had accidentally taken it home, but nevertheless, you are entitled to know that the next clue took me to Uniqlo, where I never actually bought anything before. It did have a special significance to me though, in the form of an unbelievably cosy jacket that Christiane lent me during the LPEP (and is currently still with me). Meet my good friend, Prince! There’s never a dull moment with this guy around. We’ve only known each other for quite a while, but it’s so easy to get along with Prince that I consider him as one of my closest LAmb friends. I found him “shopping” around Uniqlo, with a basket containing several pieces of clothing inside. Like Sam, he was pretending to be oblivious of the surprise, but by this time I already had a hunch that LAmbs would be giving me the clues, so I was a little dubious. True enough, as he was on his way to the cashier to “pay for his items”, he sneakily threw the clue in my direction and it landed on the bin in front of me. The next clue led me to Forever 21, a clothing store that has gotten me extremely frustrated, time and time again. They almost never have their stocks in XS, which is the only size that fits me. And yet I never learn. I would go here all the time and try on clothes, all the while hoping that perchance, a small measure of miracle would allow an S to fit perfectly. Then again, it never does. But today I came here for something else, a clue that was given to me (along with marshmallow chocolate snacks) by two people conspicuously checking out the lingerie on sale—Paulo and Jamie. I found Justine just outside Shoe Salon, surveying the entrance of Forever 21, completely unaware that we were but a few paces away. I don’t think I need to describe how comical it was when she finally realized that we were beside her, waiting for the next clue. Justine is who Christiane would like to call his favorite AC (back when we were all just AC 2K13), because she had helped him prepare last year’s birthday surprise (yes, this is Christiane’s 2nd streak), and her presence this time around is very telling of how much she values her friends. The next station was most difficult one for me, partly due to its sheer expanse, and partly because I was nearly out of breath by this time. I had to explore around the whole area, circling along the tables and food concessionaires, but no LAmb was to be found. I was about to give up when Noreen told me she needed a drink and thereafter led me to the fruit shake stand near the balcony overlooking the ice skating rink. Lo and behold, Hannah was there, ostentatiously buying a strawberry shake. Obviously, this gave away the Core’s involvement in the whole thing, no matter how hard they tried to deny it. Thankfully, Tomato was only a few steps away and I didn’t have to exhaust as much energy to look for people. Janina and Rica were already at the entrance, and they cheerfully greeted me before handing over the next clue. All the while, I thought the LAmbs went home after giving me the clues, so I bid them goodbye each time. It turns out that this wasn’t the case. Excited to know what this is all about? So was I. These two took the longest time before giving me the clue, since they had their Angel Locsin shtick… I don’t know where they pulled that idea from, but then again they’re Jiro and Simon (Jiro’s the one on the left, and Simon’s the guy on the right). They stood in front of Watson’s, where I always buy my Paganini brushes and combs. I was quite exhausted from all the walking at this point, so I had to take a bathroom break. Christiane and the Core would later on describe this as “very typical” of me, haha! Behold, the Power Mac Center: a place that holds the dreams and of hopes of today’s kids (and adults). Here, I found Nikki and Karl at the iPad mini exhibit counter, where they made a happy birthday visual for me. The clue they gave me wasn’t exactly a clue anymore. They began to blindfold me with a red bandana and from then on, it was like a trust walk for me, especially when I had to go down several flights of stairs to reach the endpoint. And who do I find there, waiting for me with a bouquet of flowers? Hey, I have a flower crown! Everyone was there, at the grassy area near the seaside! Then suddenly all the emotions, all the feels I’ve been keeping inside broke through. I cried. I’ve never cried in front of the LAmbs before, but this was entirely different. It was a beautiful happiness and they saw the side of me that no one knows but my closest friends and loved ones. I may have been headstrong, austere, and sometimes even angsty during LPEP, but I am also sentimental and grateful and loving. There was so much love that day, for my friends and of course, for Christiane. I had never felt so special and more loved than at that exact moment when the red bandana was removed and my eyes were opened to a beautiful sight, a memory that will forever fill my heart with rapture. A heartfelt thank you to everyone who was there that day, for your effort and love, never to be forgotten. I love you, guys! And you, Christiane. I love you with all my heart, with every fragment of my soul. Special thanks to my father, who went to MoA despite the traffic just so I could treat everyone to a Yellow Cab dinner. We loved every slice of Manhattan Meat Lovers, New York Classic, and best of all, #4 CHEESE!! Again, a warm thank you to everyone! Especially to the ACs, who gave me the cake, and of course, to my beloved Core: Angela (who traveled all the way to Manila from Batangas just for this), Noreen (who had to commute from Pasig), and Sarah (who was with us in well-wishes and spirit). I love you girls! Behind every clue was a letter that constitutes to the words I love you (missing an I, because the Uniqlo clue was lost.. I’m sorry). This is also very iconic of Christiane. You honestly deserve a medal for being the best two-sided printer [person] I know! It was a Saturday night, so we only stayed in the gym until 8PM as I tried to burn all the calories I consumed the day prior. As per the usual, we chilled out at Fami Mart, and I treated Mikie and Brylle to a simple salad meal of their choice. Nobody wanted to go home afterwards, least of all me, because it was the last day before I turn 19. Since this was the case, we all agreed to take a walk around Makati wherever our feet would take us. We discovered a quaint chocolaterie along the way, a fancy place I would definitely visit again. Before exhaustion came over us, we reached the Ayala Triangle and stayed at Golden Spoon for an artist’s cup. [Why do we even work out??] I got home at around 11:30PM and spent the last minutes before my birthday cooking noodles for my parents #dutifuldaughter haha! I ate breakfast at Fami Mart (our #hohol place during werkit days) with Brylle before hitting the gym. Mikie was supposed to be with us, but she overslept… why am I not surprised?? Then Brylle accompanied me to Greenbelt to go cake-hunting, where we walked under the searing heat of the afternoon sun (stress!!) just to find Conti’s and take home this lovely box of Mango Bravo cake. Yum! At home, my family made a special pasta for lunch and after blowing my mother’s birthday candles (click here to see last year’s), it was time to dig in! Another memorable birthday for me. All I wish is for a wonderful year ahead, filled with happiness, love, and learning experiences.